"I didn't choose to be a doer; I was designed to be one. This temperament--this nature--is here to stay. It's not to be erased but rather to be celebrated and used for God's glory." "May our 'what if' worry be changed to 'even if' worship as we remember who is with us. Even if our what-if happens, the good news does not change. Jesus is enough." "While God sometimes asks us to do hard things, those things are never wasted and serve a purpose far greater than we can imagine . . . no matter what happens, we are delighted in, are held by, and belong to a good Father." Made Like Martha was a perfect read for my weary Martha soul. I'm already planning on buying a copy for myself that I can take notes in and recommending it to my family once it's published! I loved how the author approached this topic. Books for the do-all Christian woman are not new, but Katie gave interesting and fresh insight. She shared her own struggles with perfectionism and Type-A thinking and offered biblical wisdom to help form a healthier perspective. She also included a Modern Martha section with insight from other writers/authors, practical ways to put the chapter topics into action, and space to reflect on your own heart and motives. 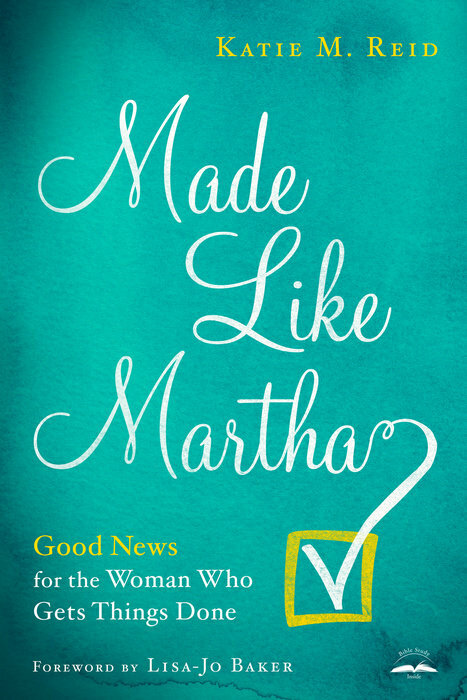 Most of all, I loved that the author was encouraging and pointed out God's love for Martha in the biblical story. Jesus did not condemn her, and He does not condemn us. He made us unique, with unique strengths and weaknesses. It was refreshing to hear from another driven woman like myself and hear her speak on her own Martha personality. Being a doer is not the problem, but the motives and attitudes that accompany the tackle-everything personality can be a problem. It's great to realize you're not alone in your approach to life, and even better, that you can use your God-given personality for His glory! I thoroughly enjoyed this book and I can't wait to order my own hard copy in July! What a great review - I literally just had a conversation with a woman at my church about how we need to stop trying to make all the "marthas" into "marys" - both were important to Jesus.. I'll have to check this out.